The All Parishes Summary Report summarizes parish-wide pledge activity, including the total pledge goal, amount of money pledged, and the total paid. The report also provides key pledge metrics so that you can understand the details behind the summaries. The report captures the number of participating families, the number of pledges made, the average pledge amount, and a distribution of giving. This report replaces the Parish Summary by Fund Report in the DDM desktop application. 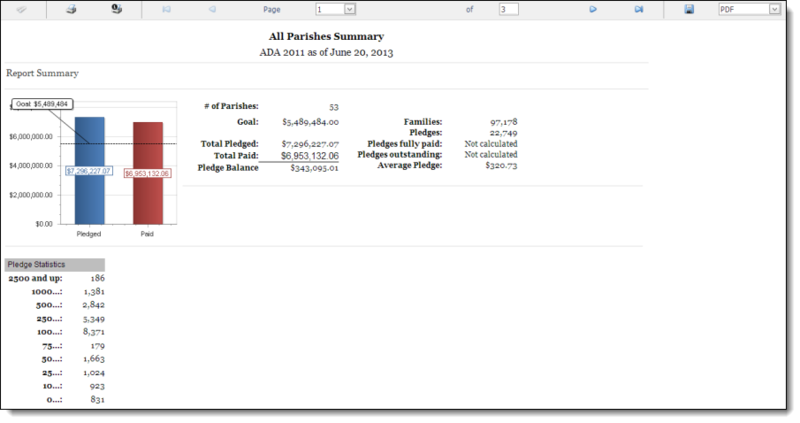 This report presents pledge and contribution data contained in closed batches only. This requirement creates safeguards to help protect users’ financial data. It also helps ensure that data processing staff follow proper procedures and exercise internal controls by closing a batch after it is reconciled with the accounting system and with the bank statement. ● The total amount pledged and total paid (as of the date of the report). ● The number of pledges paid in full and the number outstanding (as of the date of the report). The report also provides key pledge statistics so that you can understand the details behind the summaries. The report captures the number of participating families, the number of pledges made, and the dollar amount of the average pledge. The Pledge Statistics section shows the pledge range and the distribution of pledges within that range.